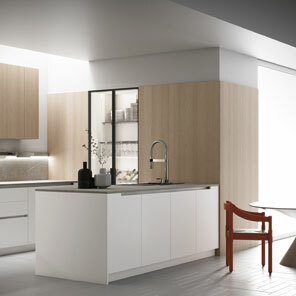 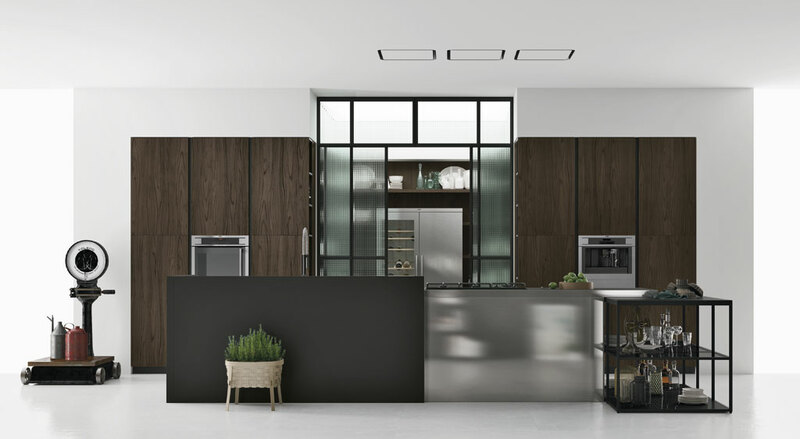 Style is a modern modular kitchen with a versatile design. 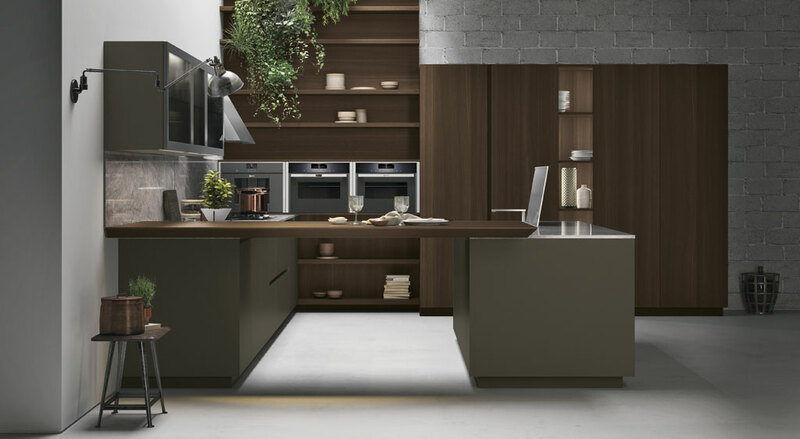 This composition is dominated by an operative island, with a laminate top, table height faux wood snack counter and an aluminium structure with an integrated exhaust hood. 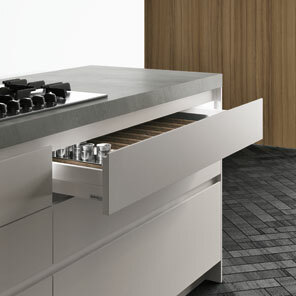 The flat groove handle is made from a metal profile fixed to the top of the cabinet front. 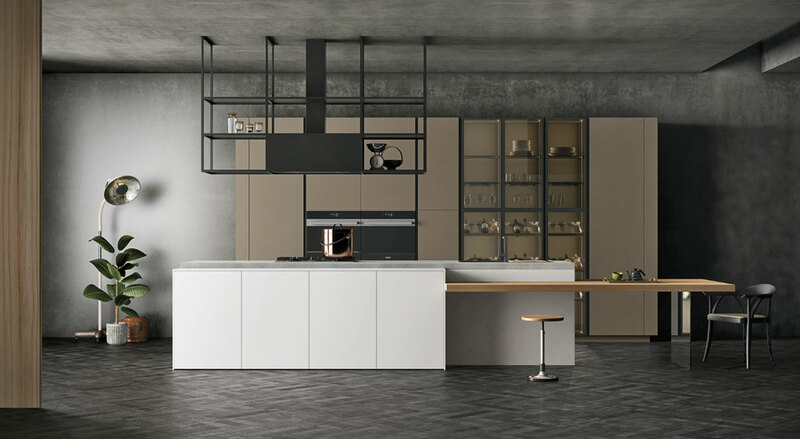 This model features an integrated suspended exhaust hood, ideal for storing pots and pans and hanging different utensils. 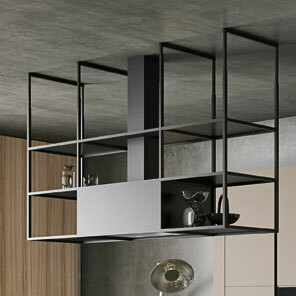 The tall cabinets are completed by handy open shelving that makes the best use of all available space. 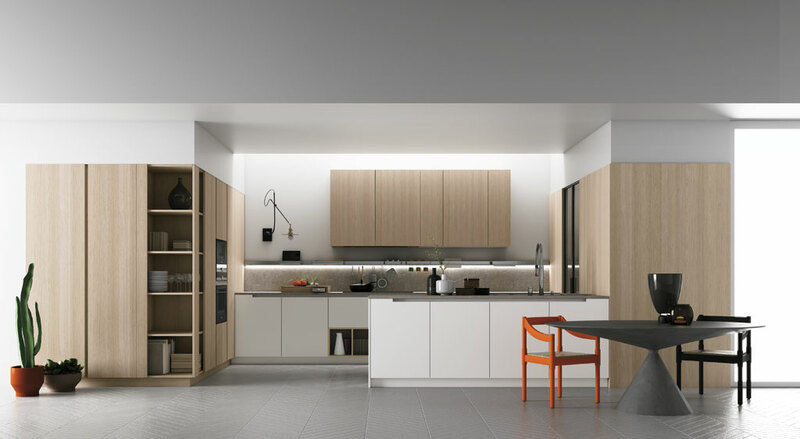 In this example, Style, a modern modular kitchen, occupies a large niche in an open space. 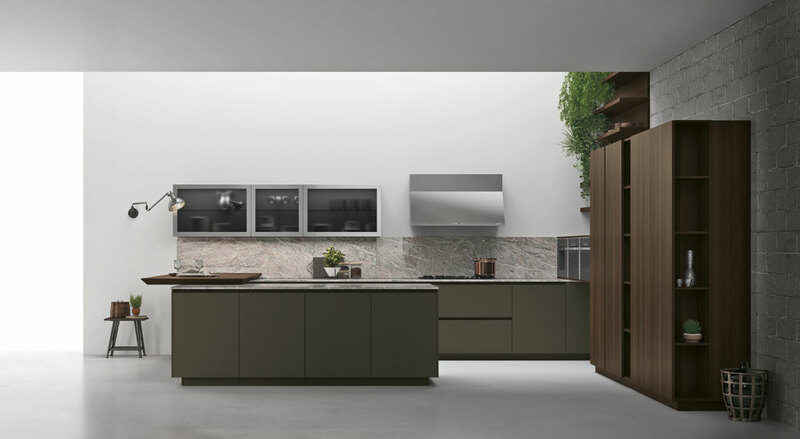 The double-depth lower cabinets divide the space and can be used from both the dining area and the wash-up area on the operative side of the kitchen. 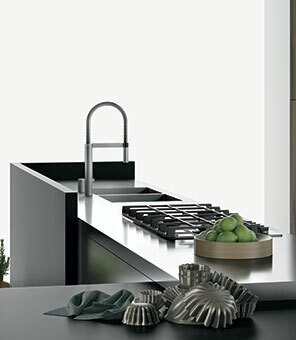 The countertop is made from compact impact and water resistant Pietra Piasentina fiammata. 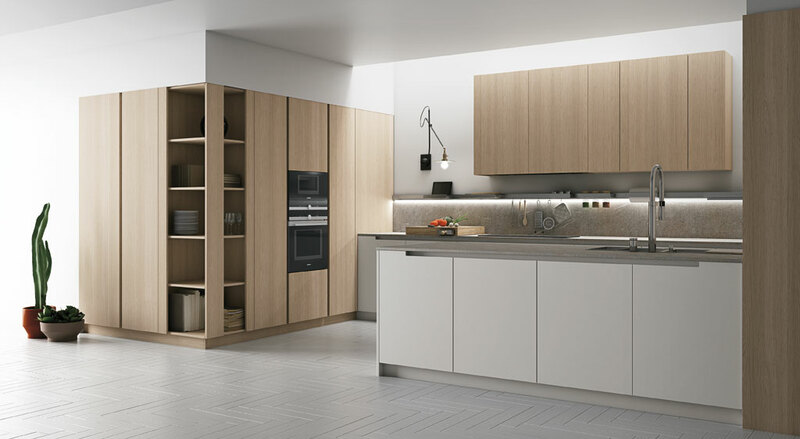 The groove handle for opening the lower cabinet fronts resembles a long and generous notched handle running below the countertop. 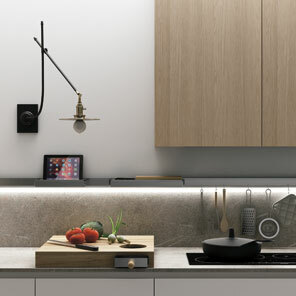 Fixed to the wall, available with LED lighting, this item is ideal for storing and hanging a vast range of utensils. 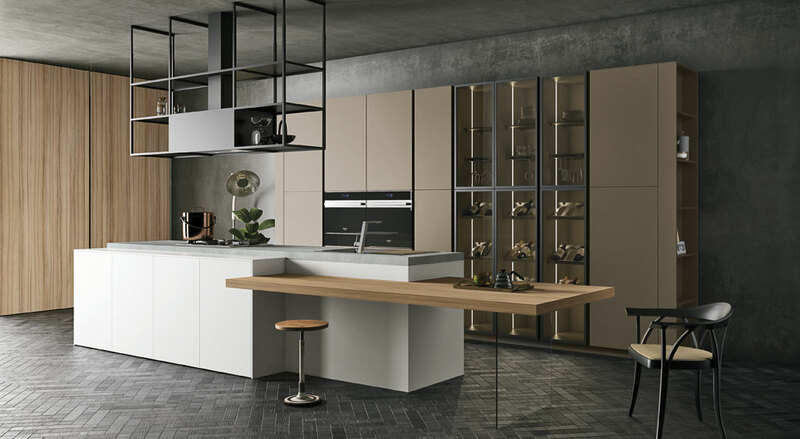 Style is a modular design kitchen, interpreted here in stainless steel finishes for the lower cabinets and details in Fenix NTM®. 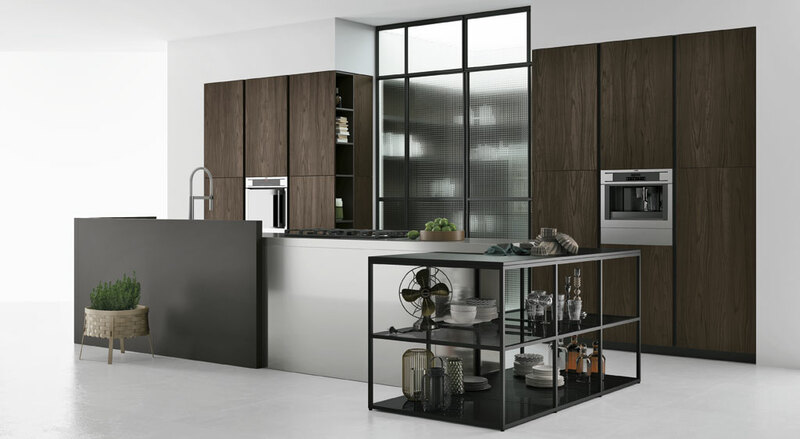 The elegant built-in tall cabinets make the most of the double height modules to offer a great deal of storage space, also on the sides facing the separate pantry area. 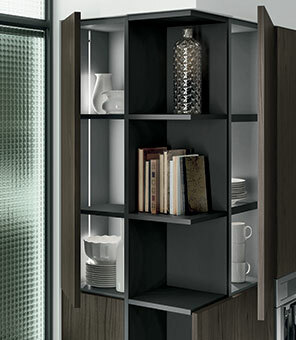 The cupboard at the end of the tall cabinet is a corner unit that continues behind the cabinet front. 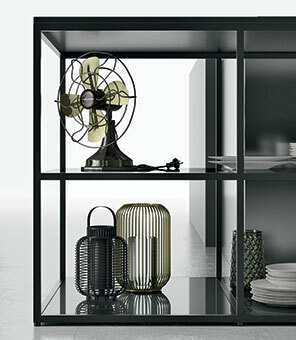 They can be found in the top of the aluminium structure and the dividing screen, a handy splashguard for the sink. 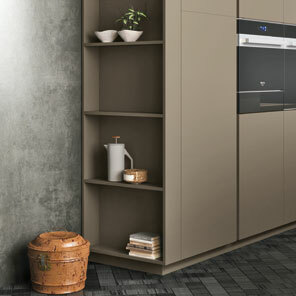 A characteristic of the Style collection, it is used here to create an open cupboard with shelves in tinted glass and Fenix NTM®.